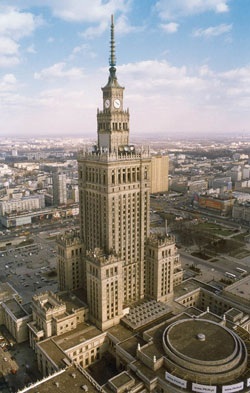 The Palace of Culture and Science is the most symbolic landmark in Warsaw. This symbol of the past has been turned into one of the largest attractions of today’s Warsaw. 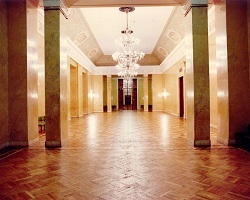 The palace is a gift fr om the Soviet Union to the people of Poland. Construction started in 1952 and took three years. Back then controversy erupted in Poland over the “gift” that society couldn’t refuse, as the whole country was dominated by Soviet Union. 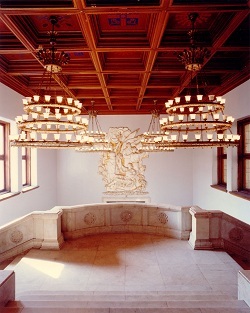 Over 550 ornamental sculptures decorate the building. The monumental walls are topped with pieces of masonry copied from Renaissance houses and palaces of Krakow and Zamość. It took 3,500 Soviet workers to complete the 230 meter-tall building. Sixteen builders died during construction. Forty million bricks were used to build the Palace, which was also known as “the people’s castle”. The architectural design of the Warsaw Palace of Culture and Science resembles other Soviet skyscrapers of that period. Today the palace stands out as one of the most photographed attractions in Warsaw. The building hosts various fairs, exhibitions, art shows and music events. The Palace is used for business and educational activities. This monumental building also includes a swimming pool, a concert hall, theatres and museums. The tower can be seen from many parts of Warsaw. The Palace of Culture is located near the central train station and the Złote Tarasy shopping center. Most of the tourists visit the Palace of Culture and Science to check out the 30th floor viewing platform, a perfect spot to admire panoramic views of the city. The surrounding area is filled with hotels, offices, and shopping centers. One of the most notorious examples of Socialist Realist architecture in the world is now surrounded by modern skyscrapers that have appeared in the centre of Warsaw in recent years. The most famous events that took place in the Palace of Culture and Science were concerts by the Rolling Stones in 1967 and by legendary artist Leonard Cohen in 1985. During communist era Polish people didn’t have many occasions to see Western artists performing live on stage, so those two concerts were highly appreciated by the audience. Among other great artists who performed at the Palace of Culture and Science were Marlene Dietrich, Luciano Pavarotti, Eric Clapton and Tori Amos.